Just wanted to drop you a quick note to let you know how disappointed I was with your weather this weekend. Plans to take the kids on their first wilderness camping trip were derailed by cold, wind and rain, leaving me with enough brats and hotdogs to host a fraternity party. No matter. We put up a small tent in the family room, allowing the kids a chance to see what it might be like. It’s not the same. So often you do this, Michigan. Swoop in and ruin things with your cantankerous weather and force us to change our plans. Months I have spent convincing myself that it’ll be great to bring four children into the middle of the woods and set up housekeeping. That we won’t miss electricity or running water. That pooping in the forest is an adventure that should be had by everyone at some time or another. Months. We got the monster tent from Costco. A tent so big that when I went to set it up inside on Friday, I discovered it was too big for our house, even with the furniture moved away. Even though our architect calls this a “great room”. We have the fire grate and the sleeping bags and the lantern that requires twenty seven dollars worth of D cell batteries to operate. And I blushed in the checkout lane to see that my cart was almost entirely full of meat. We were so ready. But, you can’t spoil all our fun, Michigan. Not all of it. We laid in that tent in the family room, listening to you throw your best thunderstorm at us and snuggled cozily in our sleeping bags, reading Pippi Longstocking and eating cold s’mores. There were still cousin sleepovers and a movie and lots of time outside hunting. There was a dead cowbird that was found and needed to be buried, but only after marveling over every little part of it. There were outside showers, the first of the season, and a great time of worship and newly framed elementary school artwork that made me burst into tears. And today we are off for our first beach day of the season. I do so love your beaches. It’s Peter’s pile. 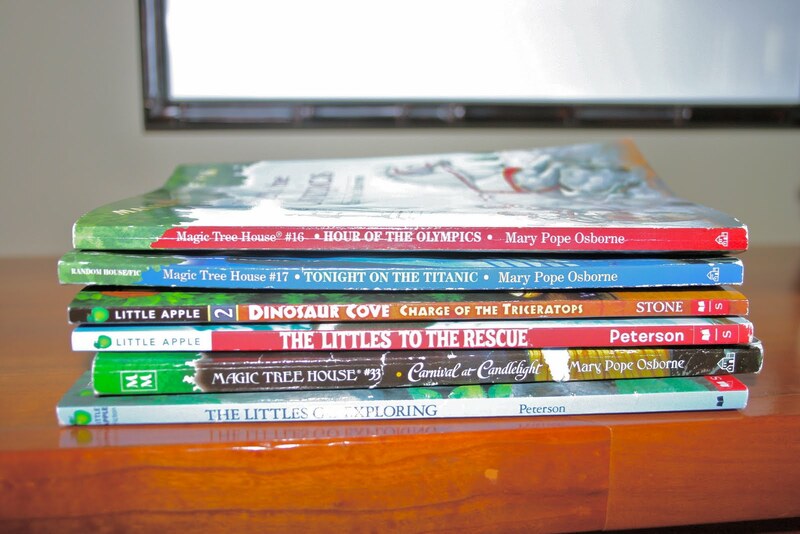 Mostly Magic Tree House, even though Jack and Annie dialog makes me want to drink. Even though we’ve read the first 10 so far this year. There are like three hundred left. But they teach history and they make a small reader feel really big. And for that I’ll always feel tenderness toward Mary Pope Osborn. Some Littles and Dinosaur Cove thrown in for variety. Because, you know, it’s the spice of life. Grant’s pile. It’s bigger. Bigger books, bigger pile. If he reads them all I’ll eat my shorts. It’s a safe bet to make. He’s a great, but reluctant reader. 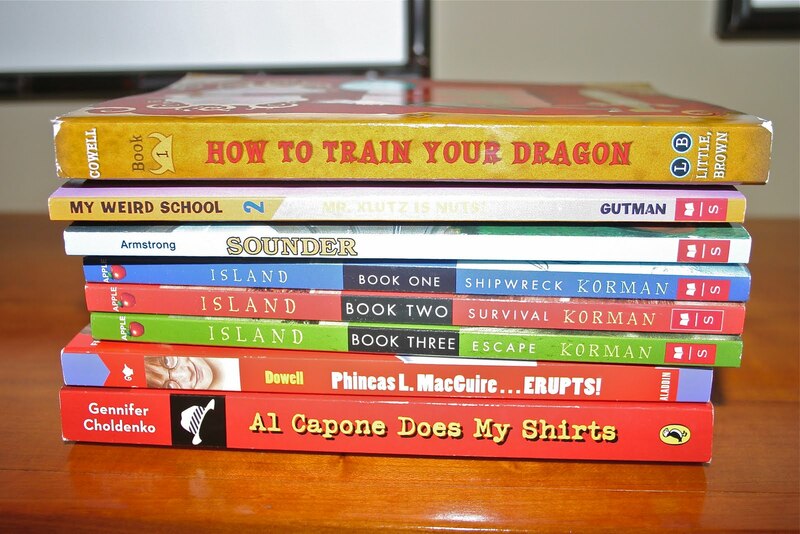 There is a series called The Island by Gorden Korman, another of the My Weird School books by Dan Gutman, Cressida Cresswell’s (tell me that’s a penname) How to Train Your Dragon, one of the Phineas L. MacGuire series…are you sensing a pattern? It’s intentional. Get him hooked on the first one and the rest will be like dangling a carrot in front of a donkey. I hope. Al Capone Does my Shirts and Sounder. 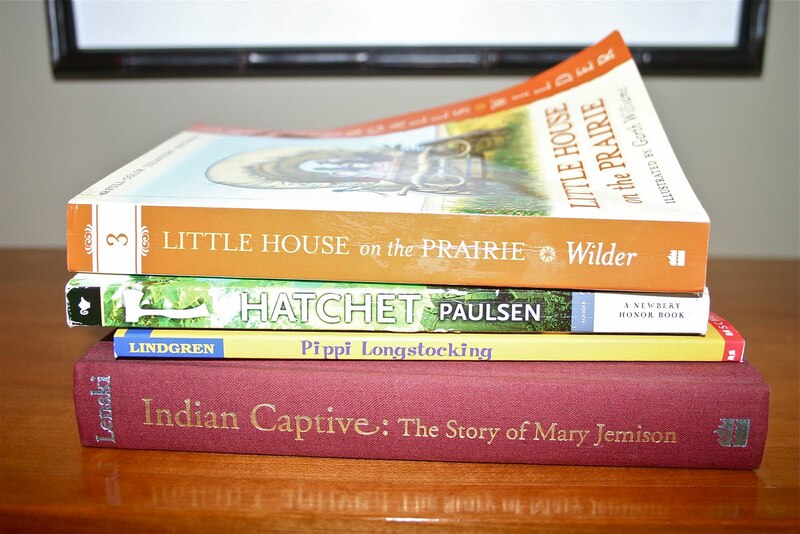 Our read-aloud pile. Can’t wait for Hatchet. Started it last summer, but the beginning talks about divorce and I just didn’t know if we were ready for it. Now, with a year of public school under our belts, we’re totally ready. Tessie and I are going to finish our visit with Laura then we’ll do Pippi with everyone. The Indian Captive is thrown in just in case we get finished with the rest. Lois Lenski…I lurve her. Am collecting all her books. Most are out of print, but that’s ok, because I want the old library bound books that remind me of summer mornings spent at Herrick Public Library building a stack of hardcover books to dive into. Best part of summer. Reading Love Wins (isn’t everyone?) and Christ Alone with my prayer group. Then we’ll chat about it on the beach, because what else is the beach for if not sand between your toes and discussions about hell? Left Neglected by Lisa Genova. If you haven’t read her first book, Still Alice, get it. Get it now. Geraldine Brooks just released her new book, Caleb’s Crossing. She’s one of my favs. Might name something after her. Like a chicken or a scar, or my friend’s walker. Geraldine. Makes me smile. Sandra Dallas is the wild card as I’ve never read anything by her, but this book is supposed to be similar to These is My Words, which is maybe one of my top ten of all time. There is One Thousand Gifts, for when I forget that I have a lot to be thankful for. Like when my bra is filled with sweat and the kids are all fighting. Then I’ll pull it out and let Ann Voskamp remind me. And thank you, Edward Rutherfurd for writing another epic. I don’t even care much about Russia, the country, not the book, but I love epics. If you do too, then you should read nearly anything by Rutherfurd or James Michener. Like Chesapeake or The Source or anything. 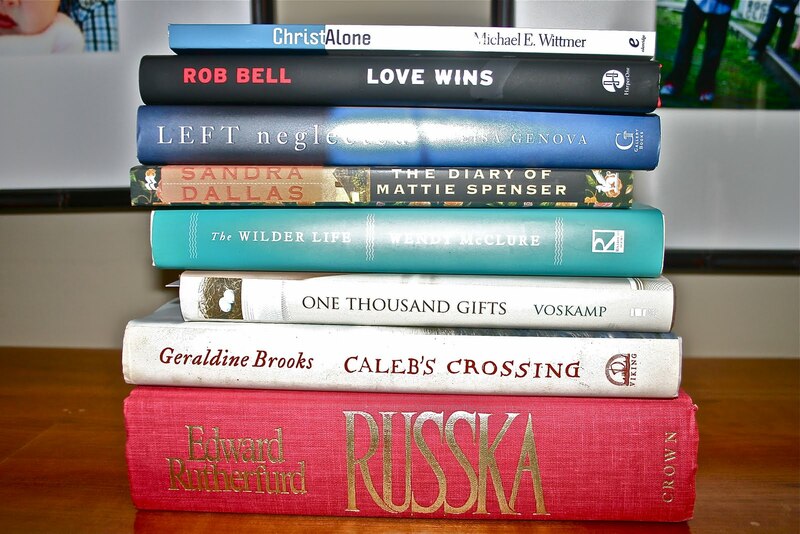 Like last summer, I take no responsibility for wether any of these are good books or not. Except for Laura. I can totally vouch for her. I just picked what looked good to me and had pretty covers. The rest is just trial and error. If you read any, leave me a comment and let me know. And if you have any brilliant reads that must be shared, please do so. Comment and let us all know so we can share in the joy of a great book. Most importantly, I’m committing to getting myself out of bed before the kids so I can spend some time in the BOOK. And with my father. Only way to start a day. Best way to end it too. This is me being real. Eager to get summer going already. ~reading jar in which they can drop a coin for every chapter read. use coins to buy prizes. ~paper chain…one link for every book/chapter finished. See how long you can get it. ~look for books that have movies about them. watch the movie as a reward for reading the book. ~trip to library/book store for every finished book. ~look for series and get the first book in the series in the hopes that they’ll want to continue reading the series. ~books on cd to stir interest. ~set aside an hour a day for books. Hope this motivates you to motivate them. Unless they’re already motivated and you can’t get them to put their books down. In that case, I’ll probably have to egg your house. I wouldn’t have posted it if it weren’t. Believe me. Not my dream to have a sign like this on my back door. But it is my dream to have children who can spend their free time running around the woods. And not be frightened by dirt or wild animals. It is my dream to have children who make forts and live in them on the weekends. Who are self-sufficient in the backyard wild. Those are my kind of kids. Just didn’t know they would be armed. But since they are (armed to the teeth and loaded for bear) it seemed prudent to have limits. At first there weren’t any. There are now (Ang, you can breathe deeply again). At first there was this rule: you shoot it you eat it. It took one afternoon spent breading and frying teeny woodpecker cutlets to toss that rule out. It took another phone call from a dear friend (you know who you are) who had it on good authority that the boys had been shooting holes in her pool cover. And at their own booted feet. It took an afternoon shooting at frogs. Dance! Dance you lilly-livered son of a one eyed prairie dog! There is no parenting book that can prepare a city girl for having boys with bb guns running wild. I’m thinking of writing one. Until I do, there have been many talks. Thanks to Peter and me (his spelling). 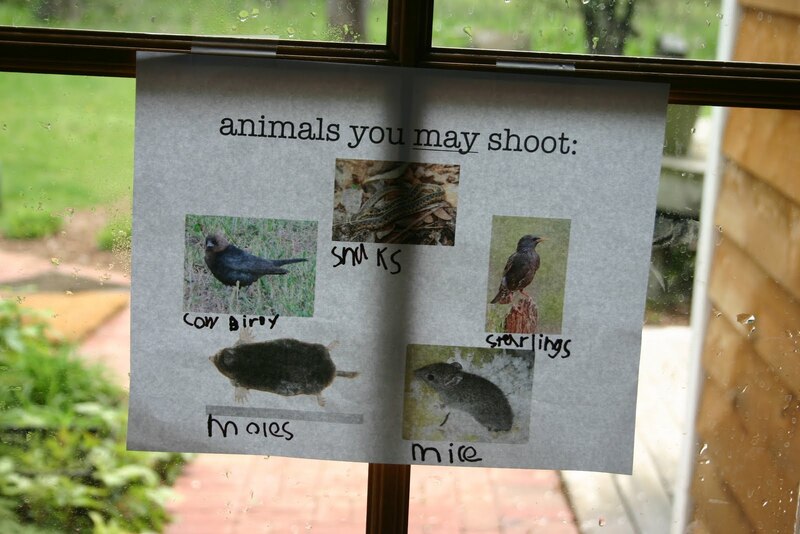 These are the animals you may shoot…snaks, moles, starlings, mice and cowbirdys. You still have to wear safety glasses. You still have to have the safety on at all times. You still have to kiss your momma. This is me being real. Ready for limits. Striking words like ‘varmint’, ‘got ’em’, and ‘bullits’ from my vocabulary. Sorry Ted Nugent. There’s a new sheriff in town. This is a plea to anyone who has successfully motivated their children to read over the summer. We’re now fifteen and a half days and counting until summer is here and they are mine, all mine, again. And I’ve stacks and stacks of good books for them to dive into, the choosing of which was no small feat considering that nearly every book written for a first or third grade boy has the words fart or burp or idiot in the title. But I waded through the crap and will post our list of kid summer reads soon, but there is another, bigger problem than finding the books and that is getting them to read them. That this bibliophile of a mother landed herself two boys who loathe reading seems cruel beyond words, but there it is. So I need your help coming up with a way to motivate them to read this summer. If you have a tried and true method, would you please weigh in and do tell? I’ll be forever indebted. Oh, and I’ll post all ideas here so the rest of you can benefit too. This is me being real. Ready to incentivize. 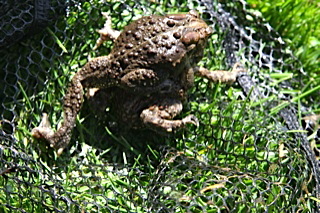 These two frogs were joined together at birth. That’s called being conjoined twins. These frogs are conjoined twins. That’s our story and we’re sticking to it. Because these two frogs were the funniest part of Mother’s Day. The poor guy on top just wanted to finish, but the kids kept trying to pull them apart. We lit a tiny cigarette for him as a consolation prize, but he didn’t want it. Just wanted to finish. Papa bought the conjoined twins story, but only because Nana and the aunts were laughing too hard to say, Dad, seriously, they’re not conjoined. Think about it. Which he did a minute later and stopped washing dinner dishes long enough to bend over and belly laugh. But only once the kids were out the door. And only after he saw how tightly the guy on top had his arms wrapped under his girlfriends little froggy armpits. He was not going to let go until he was finished. We did explain to the kids on the way home, since they were plotting how to spring this amazing scientific discovery on their classes. There was even talk of contacting National Geographic. So we explained that they weren’t actually conjoined. And Grant, who has had the full talk you’ll remember, said, Oh, wait…so they were sexing? Which I guess at the end of the day, especially one spent outside celebrating mothers by getting muddy and covering yourself with amphibian germs, is sort of the same thing as being conjoined. Sorta. ﻿Once upon a time there were two boys who lived in the country with their mom and dad, two sisters, fifteen chickens and a Keloid scar named Steve. They were happy. Then their grandmother died. This made them sad. Except the part about skipping school for the funeral. That made them happy. Their mom ordered new sportcoats for them to wear to the funeral. That also made them happy. They waited by the front door each afternoon for the FedEx guy to arrive. The day they spotted the white truck pulling in was a happy one. Eagerly they tore open the box, discarded the tissue paper and plastic and held up their new sportcoats. Immediately, they experienced a deep sense of disappointment. The older son did not want to cause his mother grief, so he said nothing. The younger son had no such compunction. He raised a ruckus. When the trantrum subsided enough for words to be exchanged, the mother very patiently asked her sons why they were so disappointed. It was true. They were not shiny. And the only thing on the back was a pleat. The mother shook her head and apologized for the mix up. The older one nodded and moved on. The younger one had no such compunction. And instead of bargaining with a child, something the mother once read she ought never do, she told him the truth. Which ended it. And that is the story of the unfortunate education of two country boys who were forced to wear seersucker sportcoats to their Grandmothers funeral because their mother made them. Even though they weren’t shiny and didn’t have their names on the back. Not even close. That is also the tale of a mother who learned to be very careful how she chooses her words. May it be a lesson for us all. I am blessed to be surrounded by many women. Good, Jesus following, honest, real women. Blessed. Women who get my stories and laugh at them, even though they are probably not that funny and who feel comfortable coming in and kicking off their shoes and staying awhile. In my home. In my heart. They teach me myriad things about motherhood. Things like caring about my floors less and the time I spend on them with my kids more. Like the new vitamin that is good for them but enough like candy that they’ll eat it. Like telling me I need to have a better talk with the boys about what they are shooting at: feet, snakes, pool covers. They are honest enough to talk tough if I need it, but loving enough to help me hear it without feeling like a loser. They are sweet and fun and warm. And I have a prayer for them for this mother’s day, even though not all of them are mothers yet: rest, loved ones. You hold life in your hands every day and I watch you do beautiful things with it and you are so deserving of a rest. For your body and your spirit. A small hour in which to do nothing more than whatever you want and nothing less than whatever you need. Sneak a chat with God in there. Let your time include some good chocolate maybe, and a book? Or whatever. Just rest. This is me being real. Thankful. And wondering why my computer wallpaper is a picture of a chipmunk with a bullseye superimposed on it. Why? In the midst of baseball games and chasing chickens who are too old to be in the garage any longer but too young to roam with the big hens (tweens?) I’ve been lazy and remiss. There are always things to write about and nearly always words to write them with, but there is seldom time and there is often a general sense of laziness that settles in when the kids are all finally in bed and I’ve punched out and need a little alone time. I know it is coming some day, but for now it seems there will never be a time when I am not mind-numbingly exhausted by the messy, wonderful business of rearing four children, fifteen chickens and a Keloid scar named Steve. Neh. Ver. But it’s coming. I feel it. In the occasional emptiness of the house while Lucy is napping and the boys are probably killing something down by the creek and trying to eat it and while Tess is lost in Ponyville. And it feels queer. But it doesn’t last long and then someone needs a bandaid and Justin Beiber is singing on my iphone and the glimpse of aloneness is gone. And I miss it for awhile, but then I remember that this mess means life and me doing it with them and this man I love and all of it isn’t always attractive but it is a gift, even when it feels like the kind of crap my grandmother used to give me in middle school. Still a gift. Remind me of that when I complain too much, ok? Because I’ve been doing that a lot lately. Been complaining about being overwhelmed and overworked. Asking for a break that lasts longer than the hour it takes to go to a counseling session, which isn’t very fun, really. Or an elf to return this bat bag I just got Grant that doesn’t even fit his helmet, for crying out loud. And to finish trimming all the perennials. Which only means that I have a son, who is healthy enough to play sports and a home that is surrounded by flowers. Which means I have nothing to complain about. So I’m imploring the Holy Spirit, once again, to fill me with fruits. All of them, but especially patience and love and gentleness. I need those most today. What do you need most today? This is me being real. Mixed up.